Third generation 8000 lb fat lifetime cow. 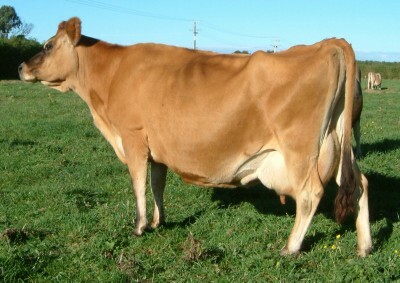 Coasts dam is GLENBROOK INDEX CARMEL EX8 ( 7-9 ) dam of COMMANDO. Next dam is GLENBROOK BRASS COLUMBINE EX6 ( 8-9 ) with 4 proven AI sons. Buttercup was the calf carried when Brenda was purchased to found this family at Glenbrook. has daughters producing to 837 kgs ms at Glenbrook. Widespread proof on over 150 dtrs. in use on the Cowan family farm in Oregon, USA. Two daughters at Cowan's in USA that were from the same flush as CHEESE. to the GOLDSTREAM Jersey Stud at 2007 Jersey pride sale.